The loud, upbeat music pulsed through the air along with vibrations of the bass. The ceiling of the La Gala ballroom was decorated with yellow string lights and large sheets of white fabric that stretched from one side of the ceiling to the other. Tables decorated with white tablecloths sat on the gray floors, and people sat at the tables and socialized while they listened to the music. People embraced, laughed and chatted. Many Bosnian people spoke to each other in their native language and sang along to the music. Huge doorways adorned with gray curtains led out of the main ballroom, where there were more tables where even more people. About 300 people attended the concert, said La Gala owner Jake Simic. La Gala, a yellow brick building that consists of 7,000 square feet of party space, is an event venue connected to Circus Square Park in downtown Bowling Green, Kentucky. La Gala hosts a variety of events ranging from political events to concerts to birthday parties to weddings. It has a full kitchen and two bars and provides food, tablecloths, flower arrangements and other goods and services for the events held there. La Gala, which opened in 2013, is owned by Simic, 57, who is from Bosnia. La Gala often brings the Bosnian community of Bowling Green together, as it hosts Bosnian events every couple of months. Simic said everyone is welcome to hold events at La Gala, and the large majority of events the venue hosts are American parties. “This place is open for everybody,” Simic said. 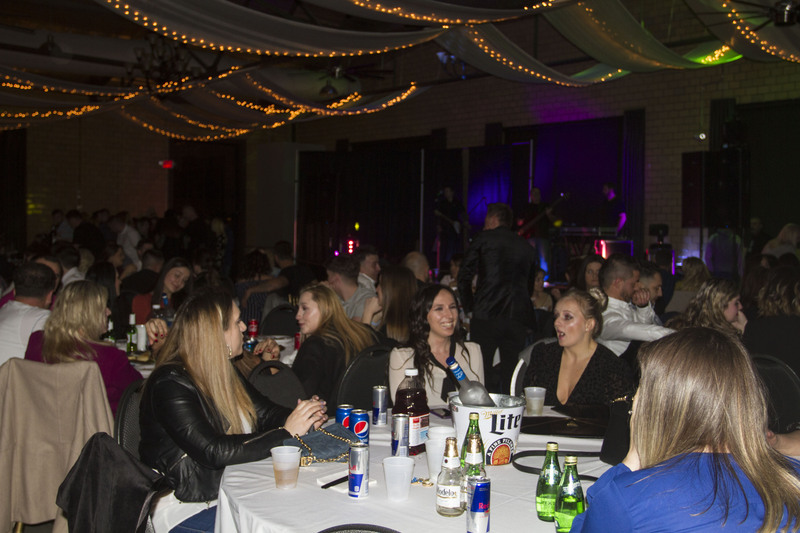 People sit at tables and eat, drink, socialize and listen to music at the Marija Šerifovic concert on March 3 at La Gala. At the Marija Šerifovic concert, Adnan Oric and Mustafa Tajic attended. They drank together and sat across the table from each other once they got up the stairs to an area overlooking the ballroom for an interview. Oric, 26, and Tajic, 28, are both Bosnian, and they go to La Gala for concerts and private events alike and to interact with people who are also part of the Bosnian community. Oric said the Marija Šerifovic concert was the “most packed” he had ever seen the place, in his experience. At the concert, Tajic said he had recently attended a baby’s first birthday that one of his friends hosted at La Gala, which was a private event. He said a first birthday is considered important for Bosnian culture. “Family means a lot for our culture,” he said. Aldin Mujanovic, 24, is another Bosnian who attended the Marija Šerifovic concert. His father owns the Olympic Bar & Restaurant at 166 Saint Charles Street off Russellville Road, and he works there as well, he said as he sat at a table inside La Gala with food in front of him. He said the food served at the concert was mostly grilled, and was a lot of beef, veal and chicken. Salen Zukanovic, another Bosnian, stood outside of La Gala during the concert and smoked a cigarette. He had a dark beard and dark eyes, and he was wearing a black T-shirt. He took the occasional puff of his cigarette as he spoke, and the smoke drifted off into the night in the soft wind. Bosnia and Herzegovina joined republics of the former Yugoslavia and declared independence in 1991, triggering a four-year-long civil war, according to an article in The Atlantic. Bosnian Serbs, who were backed by Serbia, targeted the Muslim Bosniaks of Bosnia and also other Bosnian Serbs and Croats, carrying out “ethnic cleansing” attacks. The Srebrenica massacre occurred in July 1995, over three years into the civil war in Bosnia, and marked the worst massacre in Europe since World War II as Bosnian Serbs separated out and slaughtered about 8,000 Muslim men and boys, according to Business Insider. According to a Fall 2017 City-County Planning Commission of Warren County newsletter, the International Center of Kentucky, which is located in Bowling Green, started resettling refugees in Bowling Green in 1981 and had the largest influx of resettlements of Bosnian refugees in the mid-1990s. Now, between 5,000 to 7,000 Bosnian-Americans live in Bowling Green, according to the newsletter. Like Zukanovic, Adis Mujic, 26, came to the U.S. from Bosnia in 1999. He came to Kentucky in 2001 after living in Texas. He remembered being “scared at all times” when he was a child because he grew up in a war zone. Mujic said La Gala and the Balkan events La Gala hosts, like the Marija Šerifovic concert, which he attended, bring Bosnians together. “It brings Bosnians together…kind of makes you feel like you’re back home,” he said. Simic owned a restaurant when he lived in Zenica, Bosnia, with his wife Nella and his daughter Gabi. He owned a restaurant in Croatia as well. “We used to have, like, a nice life, good life, ’til war is come,” he said. As he spoke, he took the occasional drink out of a Spencer’s Coffee cup with “Jake” scrawled on it in black marker, and his blue eyes often glanced out the window of his office at La Gala, where several framed pictures of past parties held there hang on the walls. Simic and his family left Bosnia in 1994 because of the war and came to the U.S. in 1995 as refugees when Nella was seven months pregnant and Gabi was six years old. Later that same year, in November, his younger daughter Laurie was born. Though they started out with nothing – no jobs, no apartments and just $1,400 – they started a new life in the U.S.
After working as a warehouse worker, Simic opened a restaurant in 1998 with his business partner, Robert Stupar. They opened Brickyard Café on Chestnut Street in Bowling Green, Kentucky, and owned it for 18 years until closing it 2016. “We have met lots of people in Bowling Green, you know, and we are kind of living that time American dream, you know, just like we are, my family and me,” Simic said. Simic and Stupar opened a second Brickyard Café in Franklin, Kentucky, in 2006. Now, just Stupar runs it. At Brickyard Café, Simic worked with a small banquet hall, too. He said he wanted to open a larger venue and that he saw a shortage of nice venues in the downtown area of Bowling Green. So, in 2013, he said he found the “beautiful, old yellow building” that he said used to be a ’50s or ‘60s car dealership and thought it would be a great site for a larger event venue. He opened La Gala there, and the venue has been in operation for five years. Jake’s Café, which serves food, is part of La Gala, and it also opened in 2013. It is not open to the public and does not function every day. Instead, it is reserved for special events. Simic said he named the place “La Gala” for two reasons: one, because “la gala” means “the party” or “celebration,” and two, because “la” consists of the first two letters of his daughter Laurie’s name, and “gala” begins with the first two letters of his daughter Gabi’s name. Simic said he also likes to party himself. “Always after hard work, I like to hang up with guys around and have a couple of drinks,” he said. La Gala’s facilities director, Gia Hall, 51, doesn’t have a favorite type of event. Though Hall said there are a lot of details that go into each individual event and it gets stressful, when it’s all over with, Hall sometimes gets thank-you cards from honeymoons and praise for the work done. That is one of Hall’s favorite aspects of the job. “That’s one of my happiest times,” Hall said. Hall worked several jobs including one at a Hyatt hotel in Savannah, Georgia, the city Hall’s father is from. Then, Hall moved to Bowling Green, the city Hall’s mother is from, after Simic offered Hall a job, and Hall has been working at La Gala for over a year. “They’re like my family,” Hall said when describing Simic and his family. In addition to events like concerts, weddings and birthday parties, La Gala also hosts political events. Hillary Clinton came to La Gala on a campaign stop in 2016. La Gala has also hosted other political events such as the Bowling Green Civic Town Hall event on Feb. 22, which allowed Bowling Green residents to discuss how to improve the city, as well as Western Kentucky University history professor Dr. Patti Minter’s kickoff rally on Feb. 23 for her campaign for state representative. Despite the fact they host political events, Simic said La Gala doesn’t discriminate based on political leaning when it comes to who can host events there. Simic said that running an event venue is much different from running a restaurant. Simic said that after over 20 years in the U.S., he and his family have a “good life” in Bowling Green. Simic said he is also happy that his daughters have received education. Gabi graduated from Western Kentucky University in 2013, and he said Laurie graduated from the University of Kentucky in early May 2018. “I’m happy for my kids, you know – both girls, they got education,” he said. Simic said Bosnian events, including concerts and birthday parties, take place at La Gala every couple of months. He said Bosnian parties aren’t much different from American parties. “Except Bosnians – they like to party more,” he said with a laugh. He added that in his experience, he has noticed that Bosnians stay at parties much longer. He said Bosnians are “crazy for parties,” and he believes La Gala is an important place in terms of bringing Bosnians together in the community. “This is the place, you know, if you’ve got concert or something like that, you know, just – people, they come in to see each other, to talk, to listen to music, to dance, you know, just eat and drink, you know – this is our culture,” he said.